As I was prepping for this post last night I realized this will be my and Christy’s fifth year at Maryland Sheep & Wool. I can clearly remember each year — meeting different people (what is it with meeting so many of you in line for the ladies’ room? 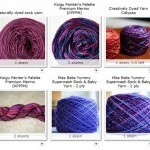 ), finding new-to-me vendors (including a time when Socks That Rock was just another hand dyed sock yarn! ), and sitting on the grass knitting and enjoying the beautiful day. If you’re new to sheep and wool festivals, I wrote a post with some suggestions a couple years back and it’s still good advice. 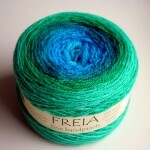 Yarn from a small supplier to make a sweater from Lisa Lloyd’s A Fine Fleece (view my review). I’m especially obsessed with Le Smoking right now. Multicolor hand dyed sock yarn. 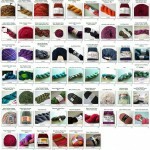 I want something with a big variety of colors to knit up a special pair of socks this summer. Sweater yarn from Tess’, Brooks Farm or Ellen’s Half Pint Farm. I’m jealous of all of you and your gorgeous post-fest sweaters! 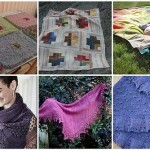 Something new – a new dyer or a new yarn. Something different that I can’t get locally. 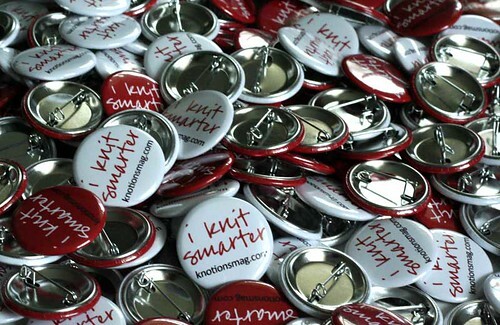 I’ll also be there getting the word out about Knotions, and I’ve got some shiny new buttons to give out. please, take a button…these things are heavy! I can’t believe it’s almost here!!! I am jealous of all you folks going down to MDSW! But I am hoping to do Rhinebeck again this year so that will be my end of the rainbow. Yay! I can’t wait! and that list of yours is quite short. I would love a pin, so I’ll be on the lookout for you! Love the buttons. Too bad I am on the other coast. If I still lived on the east coast, I would take a road trip up. Oooooh, buttons! I will totally be watching for you! If your plans include being there Sunday, I’ll happily take a pin. (No Saturday S&W for me). cute buttons! i’ll have to check out your suggestions since it’s my first time at MDSW! it’s a bit more overwhelming than stitches, i’m sure! I’ll be missing out on MDSW this year (again) but would love a button! Or are those only for fest-attenders? I can’t believe we are so close! it REALLY snuck up on me this year! your list looks great. I have many of the same things on my list! I hope to see you! Going to the rav party? have a great time at MDSW! spread the knotions word! Buttons? Oh, man! Another reason I wish I were going to MS&W… Have fun! I can’t wait!! 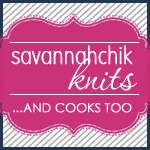 I am so excited for you and your new site too – awesome buttons!! I wish I could take a button and be a walking billboard for you! But alack, alas, forsooth, I am going to be on the wrong coast. Sigh. By something creatively dyed and unusual for me, please. I want a pin, but I’m not at MDS&W. Boo! I hope you had fun at the festival. Those buttons are great. Congrats on the new venture, I’m sure it’ll be a great success.